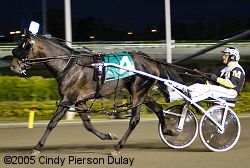 The best 3-year-old pacing colts on the continent met up at Woodbine on Saturday night in the 22nd edition of the Pepsi North America Cup. Ten colts lined up behind the gate in this $1.5 million classic, with Rocknroll Hanover sent off as the prohibitive 3-5 choice over 5-1 second choice Stonebridge Regal. As the field got underway, driver Brian Sears gunned the favorite Rocknroll Hanover to the lead right away, battling it out with 5-1 second choice Stonebridge Regal and driver Jack Moiseyev through the first quarter in 25 4/5. Parked out in the 2 path, he coasted by Stonebridge Regal on the clubhouse turn and shook him off, and was loose on the lead 2 lengths clear for the long backstretch run, getting the half in 54 3/5. Turning for home, John Campbell behind 10-1 shot Cams Fool made a late bid out wide, and got within a head of the leader with a quarter mile to go, after 3/4 in 1:23 4/5. However, the day belonged to Rocknroll Hanover, who kicked it into another gear in the lane, stretching his lead to 1 3/4 lengths with a furlong to go, and easily held off Stonebridge Regal who came on again late, to prevail by a length in a time of 1:49 4/5 for the mile over a fast track. It was 4 1/2 lengths back to 8-1 shot Runover Feeling in third, while Cams Fool faded to fourth. The win netted Rocknroll Hanover $750,000, pushing his career earnings to $1.7 million. Rocknroll Hanover wins the North America Cup. At the start with Stonebridge Regal and Runover Feeling out front while Rocknroll Hanover is not far behind. Driver Bryan Sears and trainer Brett Pelling with Rocknroll Hanover in the winner's circle. 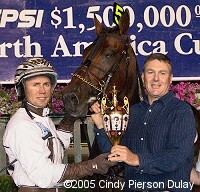 Trainer Brett Pelling, winning his third North America Cup, said, "He's as big and strong (as his sire Western Ideal). He's got a huge amount of strength and power. We're really finding out he has a lot of speed. I never really thought that he was a high-speed horse. He's proven now as a three-year-old that speed is not an issue. He's all grown up now. He's really gone from two to four. Now as a three-year-old he seems fully matured. He's taken everything in stride and just doesn't act like there's going to be a problem, knock on wood." 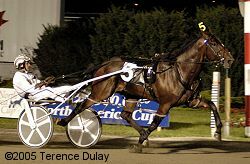 Pelling said that he will go next in the Meadowlands Pace in July. Owner Jeffrey Snyder's son and daughter with the North America Cup trophy. Rocknroll Hanover warms up prior to the race. Driver Brian Sears, winning his first North America Cup, said, "I was hoping to get the drive on that colt when he came back. Everything worked out. I'm happy to be driving him. He's a really strong horse and he gets respect that he deserves. The trip worked out the best it could possibly work out for me. Out of the gate, I was going to leave hard and just see what happens. I didn't know how many horses were going to be leaving outside of me. I was just going to play it from there. It's fun. I've enjoyed it all. I look for more chances like that." Second place finisher Stonebridge Regal in the post parade. His trainer Bob McIntosh said, "I thought he raced better than any horse in the race to tell you the truth. Jack drove him great. We were locked in by the other Pelling horse [Cams Fool] on the outside and Rocknroll Hanover backed it down pretty well. By the time we got loose it was a dead sprint and at the wire we were gathering [Rocknroll Hanover] in. So, I was very pleased with my horse. I think he bodes well for the future. Tonight was the best he's ever raced. I'll take the check. It's a nice piece of change." Third place finisher Runover Feeling in the post parade. 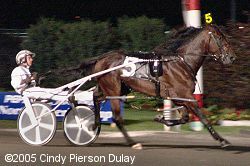 His driver Luc Ouellette\ said, "I was hoping maybe Rocknroll Hanover would take back and race from behind since he took the five-hole. Clearly at the eighth pole, he was going to keep coming and we were going to get away third and we were going to have to see what happens. I think this colt is just peaking right now. He didn't win tonight, but he got beat by two very good horses and at the wire he was coming really strong." 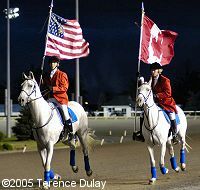 Before the main event, nine horses who did not make the Cup final competed in the $100,000 North America Cup Consolation. 5-1 third choice With Anticipation (#9) rallied from sixth early to just get up by a head in the final strides for the win over 8-1 shot Michaels Marvel, in a time of 1:51 1/5. 8-5 favorite P Forty Seven disappointed finishing fifth. Two other stakes races were contested on Saturday night. 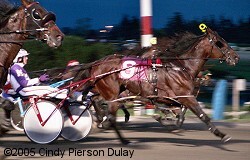 The $342,100 Goodtimes Stakes featured 3-year-old trotters. 5-1 second choice Classic Photo stalked the early pace of 6-1 shot Ro Lo, and took over inside the 1/8 pole to win by 3/4 length in a time of 1:53 1/5. 2-5 favorite Great George Two broke stride right at the start of the race and was never in contention, finishing a disappointing ninth. Goodtimes Stakes winner Classic Photo is shown here warming up prior to the race. The last stakes race of the night was the $565.000 Elegantimage Stakes for 3-year-old trotting fillies. 1-2 favorite Blur took over the lead on the clubhouse turn and never looked back, getting loose on the lead down the backstretch and holding that lead through the stretch to win by 1 1/2 lengths over 5-1 second choice Jersey Gal in a time of 1:55 4/5. Trainer and driver Trond Smedshammer said, "I didn't train her last year, but the owner (Barry Goldstein of Hewlett, New York) called me this winter and asked me if I would train her for him. I actually tried to buy her off him last year but he didn't want to sell. So I was happy to get her. I knew she had a lot of ability. She's a nice filly. She's three-for three (this year), so what more can you expect. After I got to the front, I was pretty comfortable. I've felt her better than she was tonight but she got the job done." Elegant Image Stakes winner Blur is shown here warming up prior to the race.